The four other themes of An Inspector Calls discussed on OxNotes are Responsibility, Social Class, Sexism and Gender Differences and Age Divide Between Generations. Click the links to visit those themes. This page discusses conflict between each character. ​​Conflict includes disagreements, arguments and battles between characters. Priestley shows that conflict is at the heart of the Birling family by making characters in the same family have opposing views and making them stand up to each other, conveying conflict is present in upper class even though the upper class hid it from society. Priestley creates conflict between the Inspector and the older Birlings by showing that they attempt to belittle the socialist Inspector. Read about conflict between generations in the theme of 'Age divide between generations'. Priestley’s creation of conflict support his message that no one is perfect in society, removing the façade that the upper class had. Priestley also conveys the conflicting views between the upper and lower class. ​Priestley shows his disgust and hate for people who look down on others through the upper class and lower class characters. The author presents his own hate through the character of Inspector Goole who creates conflict by questioning the actions of the upper class characters. Priestley also presents class conflict particularly with Mr Birling. At the beginning of the play, Mr Birling is shown to look down on Edna the maid as a lower class person through his treatment of her. To further understand class, read more on the theme of 'Social Class'. The audience is told of how Eric took advantage of Eva when drunk, how Mr Birling forced her out of work for voicing her opinion and of Gerald’s loveless. This shows the men to be callous in many respects and to be exploiting women. However, Eric’s remorse also shows how Priestley believed if the men and women all realised the need of change with regards to attitudes to women, things would become better for everyone. However, Mr Birling not changing his views creates tension and conflict between these two characters. Varied classes are represented by characters from Edna the maid to the wealthy factory owner Mr Birling. Mr Birling is presented by Priestley to look at Edna as below him, this 'snotty nosed' idea is shown at the beginning of the play. The Birlings’ social status becomes a point of conflict amongst members of the family, as the children grow ashamed of their family’s ability to use their influence immorally and the parents remain proud of their social and economic position and do not understand their children’s concern. At the end of the play, there is conflict between the younger and older members of the Birlings, the younger generation feel responsible (see the theme of responsibility) while the parents and Gerald take it as a joke. Start: Mr Birling and Sheila clash with their opposing views on the treatment of lower class workers and taking responsibility. Middle: Eric and Mrs Birling show a different moral side. 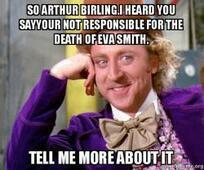 Mrs Birling judges Eva Smith and the father of her child immediately, she also judges men that drink and sleep with women of the night. She even said the man responsible should turn himself in and take full responsibility. She then finds that her son not only drinks, but he is the father of that girl’s child and he picked her up in a bar. She in her head elevated herself from those sorts of people, of course her family could not be like that she was of a much higher social standing. End: Sheila and Eric have changed as they have learnt from their mistakes, unlike their parents and Gerald Croft. The four other themes of An Inspector Calls on OxNotes are Responsibility, Social Class, Sexism and Gender Differences and Age Divide Between Generations. Click the links to visit those themes.